Learn all about the TCL 65S405 television, a high-quality, budget-friendly, 4K smart TV. Find out how it stacks up against competitors, get the specifications and see what reviews have to say. Also, get our insight and learn more about the TCL brand, including how the company offers such low prices. Buying a television these days can be a chore. There are so many choices. Beyond just choosing the size, you also have to think about the resolution and smart TV options. It can take some time to narrow down your selections. Then, you have to do research to get the details on each TV. Not to mention, some of the televisions on the market right now are quite expensive, so you have to find room in your budget to even buy one. We know the struggle. That is why we decided to review the TCL 65S405. This is a budget-level television. It is also a smart TV. We will go over the specifications and tell you more about TCL and some of the special features of this TV. 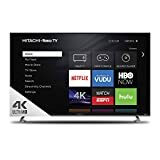 We will also compare this TV with a few other options and go over the pros and cons based on reviews from people who actually own the 65S405. We hope our review saves you time and gives you all the information that you need to make an informed decision. What Is the TCL 65S405? TCL may not be a brand that you have heard of, but it is the third-largest television manufacturer in the world, so it is no small potatoes. This company is quickly growing in the U.S., too. It is focused on creating TVs that are reliable and affordable but that also use innovative ideas and bring you the technology you crave in your electronics. The whole idea behind anything TCL produces is to give you a good value. One of the ways that the company manages to keep its prices low, often much lower than the competition, is by making all the components that go into its units. By handling all aspects of production, the company can pass savings on to consumers. This concept is called full vertical integration, and TCL is only one of three TV brands that is doing this. In addition, TCL has 35 research centers that stay on top of new technology, and TCL works to bring this technology to the products it sells. One product that TCL has really done well with is the smart TV. The 65S405 has built-in Roku. Roku is a streaming platform. It allows you to download apps and manage your television all in one program. You do not need any external devices because Roku is built into the TV. The remote operates everything, including the streaming platform. It is even customizable. This technology helps to make the 65S405 more user friendly and creates a television that goes beyond the basics to bring you a great viewing experience. The inputs available include an RF input. There is also one USB port along with three HDMI ports for adding accessories. Because this is a smart TV, it is internet compatible. The TV has built-in dual-band Wi-Fi. It also has an ethernet port for hardwiring if you want. In order to provide a smooth experience, it is equipped with a dual-core processor. Managing and operating the TV is pretty easy. It comes with a Roku remote with some preset buttons. It is a simple remote that shouldn't have a steep learning curve. You also can operate the TV using the mobile app. The remote or app lets you customize menus, adjust television settings and download and play apps. With Roku, you have access to more than 4,500 channels and apps. Roku is often touted by experts as one of the best smart TV platforms because of its usability and functionality. This TV weighs 45.4 pounds. The TCL 65S405 has a manufacturer's suggested retail price between $750 to $800. This is a great budget price, but you can often find the TV for even less if you shop smartly. Best Buy and Walmart are both selling this unit for about $590 to $600. Newegg has it at that price, as well. That looks to be about the lowest it is priced at any retailer. However, TVs quickly get discontinued and discounted as new models are introduced, so it is only a matter of time before the 65S405 is also facing steep discounts as new models roll in. Keep in mind that TCL is a budget brand, so its TVs are never going to be super expensive. You will also find that your money goes further with TCL. You can get a larger TV for less. Other brands sell smaller TVs for this price, but the smaller size reduces the value. There is no need to pay more than you have to. 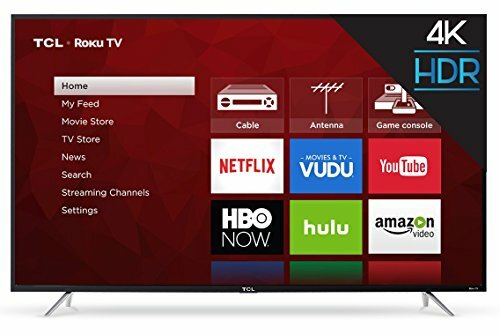 Even when it comes to TCL TVs, make sure to shop around and find the lowest price so you don't end up overpaying. This brand is widely available pretty much anywhere you can buy TVs. Comparison shopping gives you the chance to make sure the product you are looking at is a good value. However, it does take time to do. Since we are trying save you the hassle, we went ahead and did the comparison shopping for you. We left out bias and stuck with facts as we rated and compared the TCL 65S405 with three similar models from other brands. Below we offer some simple ratings for a quick comparison, along with additional information. Really, there were not a lot of bad things people had to say about this model. The major complaints were from people who didn't feel a budget TV could stand up to well-known brand-name TVs. Taking away that complaint, there was an overwhelming consensus that this TV looks amazing. It handles upscaling very well, showcasing the true beauty of 4K images. The Roku platform only adds to the value because it is easy to use. It is especially great for those who cut the cord and no longer have cable or satellite. For those who do not want to spend thousands of dollars on a TV, this model is a real winner. Paying for a brand name means you get a smaller TV for the same price as the TCL. However, this is a smart TV, and it is 4K. It uses Samsung's smart TV platform, which is fairly easy to use. During setup, you will be prompted about seeing ads from Samsung. While you can decline this option, some apps, such as Netflix, won't work if you turn this option off, which is a huge issue for users who rely on Netflix for streaming. It does have excellent picture quality with low black levels. The wide viewing angles could be better. Since it uses its own streaming platform, it may not offer all of the apps you use. You should thus check the available apps before buying. Again, you get a smaller TV when going with a better-known brand, but this is a 4K smart TV. There are complaints that the backlight isn't great, causing a cloudy appearance. However, the overall picture quality is very good. This TV weighs only about 20 pounds, so it is super lightweight. Great technical support is another perk of buying from Sony. Overall, people seemed pleased with this television and the quality of it. Most of the complaints this TV received had nothing to do with the actual TV but were focused on delivery issues. This is something to watch out for when reading reviews or looking at ratings because these comments are not related to the quality of the TV at all. This TV is from a lesser-known brand. It also is a Roku 4K smart TV. So of the TVs in our chart, this one is probably the most comparable to the TCL. People love the Roku platform because it's easy to use and has a lot of apps. However, the quality of this TV is lacking. It probably has the lowest quality of all the TVs here. While the picture is fine in the beginning, the TV really is not reliable, so the picture quality can diminish. Some consumers had issues with interference or blinking. You probably know customer reviews are a great source of information. They can help you see the flaws in a product and give you an idea of what is good. However, they also can lack accuracy and truth. It is not always easy to go through reviews to get to the heart of things. That is why we did it for you. We looked over countless reviews to drag out the truth, which we present to you below in a pros and cons list. The biggest thing consumers say about this TV is that it is from a budget brand. Some people want a brand name, while others focus on the quality of the product. Those who didn't care about the brand name seemed to have the best reviews of the TCL 65S405. Some people had major bias because this TV isn't from a well-known company. However, as satisfied users often commented, why pay twice as much for a TV just to get a brand name when the picture color and experience are just as good with this TCL model? There were many happy customers who had no doubt that saving some money was well worth it and felt as if they got more than their money's worth by going with this television over pricier options. Despite the fact that there are a couple of minor things about this TV that some users may not like, overall, this is a very excellent television. So we went with a perfect five out of five rating. We felt that the good just outweighed the bad by far. With so many reviewers putting down the TV because it is not from a top brand name, it was often difficult to get to the actual reviews that gave the truth. But we managed to weed through the biased reviews and found that this is a really great TV with a price that is budget friendly. If you are someone who has to have the best and bases your decisions on brand names, then the TCL 65S405 may not be for you. However, if you are willing to give TCL a chance to prove it can pump out products that can stand up to the big guys, then you should be reasonably happy with this model. It really is a strong competitor in the 4K smart TV market. You not only get a well-made TV, but you also get the benefit of Roku, which cannot be denied. TCL did a very smart thing by teaming up with Roku. This platform makes streaming simple. It provides access to all the popular apps, such as Netflix, Hulu and YouTube. It is also simple, which makes it very easy to use even for streaming newbies. Overall, we are pleased with the TCL 65S405. We feel it provides an amazing value to the consumer and stands up nicely to the competition. We would highly recommend this TV to those looking for a budget-friendly 4K smart TV. As a Television that offers excellent user and entertainment experience, this model is a very affordable. With its amazing picture quality this model also eliminates sound delays. However, this model has a dimmer picture brightness compared to its counterparts.